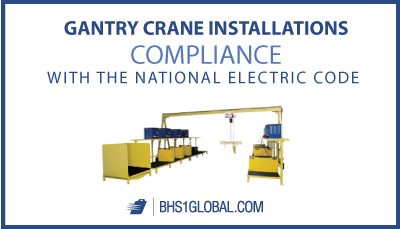 Construction electricians are occasionally called upon to install a gantry crane system. The National Electrical Code provides specific rules for such an installation in Article 610, but gantries differ from other electrical installations in one particularly surprising way. Specifically, we’re talking about disconnecting means for the power supply. The NEC is pretty clear on the subject as it pertains to general installations, and even more so in the case of gantries and monorail hoists. Code 430.109 provides specifications for the disconnecting means installers must use, while the following section describes the required ampere rating and interrupting capacity. Access these requirements for free through the National Fire Protection Association website here. You must be able to lock the disconnecting means open, too. Article 110, Requirements for Electrical Installations, provides the details in section 110.25, Lockable Disconnecting Means. Not every gantry system has to meet these requirements. The installation is exempt from the disconnect mechanism as long as it meets three requirements: Users must be able to operate the system from the floor; the user can see both the crane and the power supply connection (which is itself equipped with a disconnect); and the unit doesn’t include a work platform for service access. Article 610 of the 2017 edition NEC, which concerns cranes and hoists, contains 61 discrete sections. So why focus on the means of disconnect? The answer is that rules for these systems differ slightly from those for motors and controllers more generally. Electricians who regularly work within Article 30 of the NEC (that’s the one covering motors, motor circuits, and controllers) might assume that the rules are the same for a gantry or monorail hoist. In fact, these specialized machines have their own set of rules. Learn more in the latest edition of NFPA 70, but generally speaking, if you install a disconnect means in a gantry system according to the above, you should remain in compliance with the NEC. Lamendola Mark. “The Disconnecting Means for Cranes and Monorail Hoists.” ECMWeb. Informa, 18 Dec. 2018. Web. 20 Dec. 2018. “NFPA 70: National Electrical Code 2017.” NFPA. National Fire Protection Association, 2017. Web. 20 Dec. 2018.